Once upon a time, there was a little princess with big brown eyes, chestnut curls, and a cheeky nature. This little princess hated being cooped up inside, so she was very sad when a dark rainy day stopped her from playing outside. The clever and beautiful queen had something special saved for a rainy day exactly like this one and the little princess was so excited to find a pretty new dress waiting for her on the royal bed. As soon as she had her pretty new dress on, the little princess ran through the house to find her jewels. After all, a pretty dress needs pretty jewels to complete the outfit. The little princess with big brown eyes was not sad about the dark, rainy day anymore. When I won tickets to see Disney on Ice: Princesses and Heroes I knew from past experience that I needed to find Lorelei something extra special to wear. I've been to many Disney on Ices before with Madeleine, and I remember how sad she was the first time we went when she saw all the other little girls dressed up as princesses and she only had nice going out clothes on. Never made that mistake again! Having bookmarked Fairytale Treasures a long time ago, (how can you not LOVE that dragons cape) I returned to find inspiration and found it in abundance. With plenty of gorgeous princess costumes to choose from, it wasn't long before I fell in love with the beautiful Snow White inspired costume. With her deep brown eyes and curls, I knew my Lorelei would look exactly as though she had stepped out of a fairytale story book. And the costume did not disappoint. It's beautiful quality fabrics, and puffy tutu skirt has had her twirling for hours. I love supporting new Australian businesses, especially when they have such beautiful products. Fairytale Treasures has been live now for just on 13 weeks, and has already built up a huge community. For anyone wanting to see these stunning treasures in person, they also have a stall set up at Bondi Westfields for 2 weeks starting this coming Monday (17/06). A little inside birdie also tells me that there will be a sale on selected princess dresses, starting this Friday, so for anyone wanting something a little special for your princess to wear to the Disney on Ice performances, this website is definitely worth checking out! Besides the cutest little costumes you can imagine for your kids, they also carry a line of pet costumes, party supplies and room decorations. Everything you need to bring some fairytale magic into the lives of your royal littlies! For your chance to win a Snow White inspired tutu dress for your little princess (sizes on the website), enter via the rafflecopter below and answer the mandatory question after visiting Fairytale Treasures to look over their costumes. As always, bonus entries for overachievers! Oh the Beautiful Belle costume is adorable!! I love the boys harry potter costume, my son would love that! This would make my daughter cry happy tears!! The little miss pirate costume is very cute! My two busy bees think the Kids Bumble Bee Fairy Costume is BEEutiful! They would love to Buzz around the backyard between the flower gardens wearing this dress. Mirror mirror on the wall who's the most beautiful of all. Snow White of course. Always holds a special wow, no matter how many years go by. I love the bumblebee costume, bright and colourful, perfect for my busy little boy! The baby mermaid is my favourite. LOVE LOVE LOVE the Leopard Princess! The Oriental Princess is very pretty and different! Love the Batman Romper for my son, and Little Cowgirl for my daughter! Too cute! My son would love the Little Ninja costume - I could see him rolling around the floor doing his 'ninja' moves! Snow white is adorable and the ONE!! I love the Little Cowgirl! Yeeeehaaa! Love love love the mermaid outfit!!! The Little Red Riding Hood costume is just too cute! I have 2 ninja crazy boys so I would say the ninja for them but I have just had a baby girl and the bumble bee fairy costume would be just perfect for her when she is a little bigger. Absolutely gorgeous range and there is definitely something there for everyone. Little Red Riding Hood is gorgeous. The Kids Dinosaur Costume looks fantastic! Easy for little one's to put on by themselves and roar like a prehistoric creature. Great choice for my little boy and girl stompers in this house. To have a little “Bee” helper dressed in character will bring on cheers! Endless hours of fancy dress up I definitely foresee! 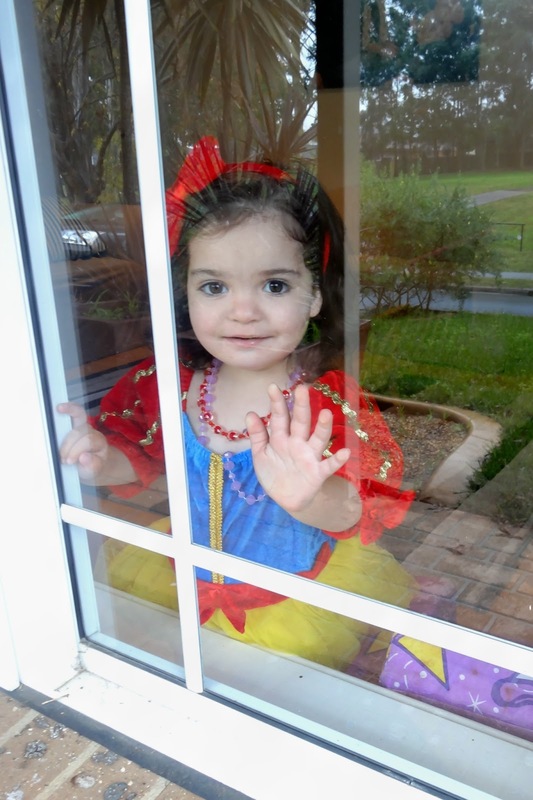 How precious, love the photo through the window! Little Red Riding hood is beautiful! I'd love to take some photos with my newborn in the princess pettiskirt! The baby mermaid, the Minnie mouse.....I love them all. The utterly adorable Superman romper! 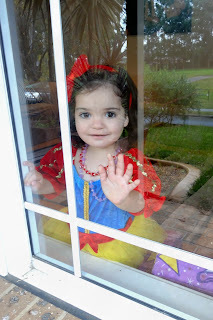 The Snow White Costume is beautiful, I have just the little girl who will look gorgeous wearing it. I dearly love the Little Gentleman Romper - Black Master Mason has his aunties wedding to go too and it would look great in the photos. I love the little red riding hood outfit- not just for dress-ups! The dinosaur- who doesn't love a good roar?